This report illustrates how Roland Berger GmbH, as the German pillar of our group, is working to bring the Global Compact to life in our consulting operations. 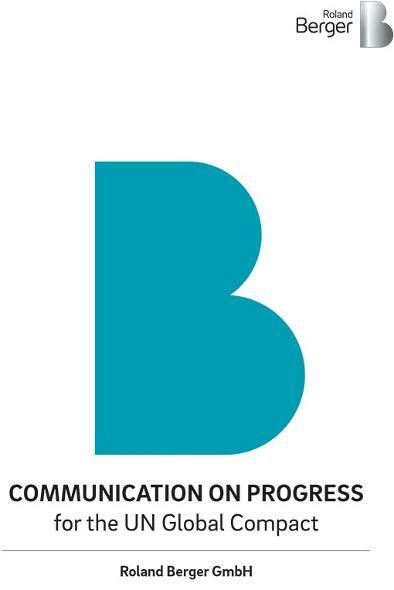 This Communication on Progress is the third report after Roland Berger Strategy ConsultantsGmbH became a member of the UN Global Compact. In September 2015, our firm's namewas changed to Roland Berger GmbH. The following report describes the current statusand past development and what we plan for the future, by setting goals related to the tenprinciples of the Global Compact. The following report describes the current status and past development and what we plan for the future, by setting goals related to the ten principles of the Global Compact.